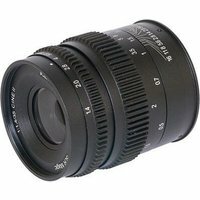 Suitable for both photography and cinematography, the SLR Magic CINE II 35mm T1.4 is a manual focus, lightweight, compact fixed focal length lens designed for use with Fujifilm X-mount compact system cameras. It has an integrated follow-focus set-up and a fast T1.4 to T16 aperture with a de-clicked iris for smooth, silent operation, which is essential when filmmaking. This mark II version has improved focusing and a more robust front section.